Please clarify for local discussion. First is a coin simulating a fossil. If split at the red line, there would be 2 pieces of external mold. Correct ? or incorrect ? Second is a lens shape, like a saucer or moult of a pygidium. If split at the red line, there would be 2 pieces of external mold. Correct ? or incorrect ? Third is an egg or complete bivalve. If split at the red line, there would be 2 pieces of external mold and 1 internal mold. Correct ? or incorrect ? All 3 assume that the specimens have dissolved an left a void which if filled would be the cast. Correct ? or incorrect ? The local argument is that the pygidium moult example is 1 external mold (top) and 1 internal mold (bottom) because it is the "internal" side of the animal. I don't think that is correct. Just a local discussion needing clarification, thanks. This is a sticky wicket, that has been discussed here before. Question 3 - a - Correct. b. They are also called internal casts. If there is no integument, in my opinion, it would be a mold, because it is the bottom of the top mold, and the integument is the cast. Others will chime in, I'm sure. Thanks Tim, I'm with you, mostly. From what I've read I would not call that an internal cast. What if it were half of a bivalve ... one shell ? Or what if it were a complete bivalve that was opened 90 degrees ... or 180 or 1 degree ? Would you then call it an internal cast ? The only cast I see would be the integument. I'm new, so please bear with me. Just want to be clear. Will check the link provided too. 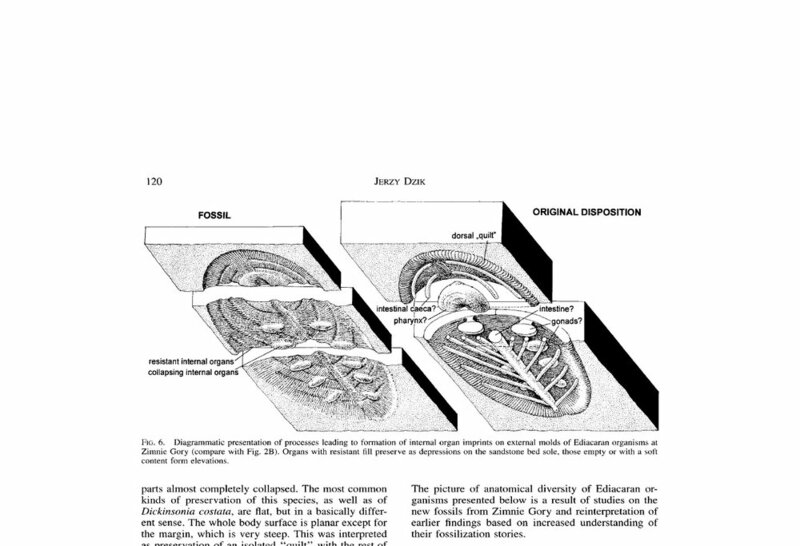 As I tried to explain regarding the pygidium example, "The bottom half is the external mold of the internal surface of the pygidium, not and internal mold". You start with the mold. You pour liquid heated metal into the mold. You open the mold when cooled - and you have a cast, right? So when the shell gets filled with mud, it hardens, shell dissolves away, you have a cast of the interior of the shell. People call these, correctly or incorrectly, internal molds or internal casts. I see it as a cast, because it is free of the surrounding matrix, and is an item unto itself, like a pot that has been cast in iron. If you plopped the cast into liquid latex, then removed the cast when the latex cools, you then have a mold of the cast. You can go around and around with this ... not sure you will get any direct answers one way or the other, ... I have seen them described as internal molds and internal casts. In the case of your argument, it could also be argued that the dissolved shell is much like the integument, therefore - the left over is a cast. Whatever floats your boat, Rocky. As long as we get our point across, there appears to be no right or wrong. No problem, always happy to confuse the issue further. Was clear as mud, now beginning to solidify. Thanks Tim for covering all points of view and not referring to an opposing view as nonsensical! This is one that we have never had total agreement on even though much time and effort has been applied to the subject. You will see a steinkern referred to as both an internal mold and an internal cast. For purposes of this forum and most web based "science" magazines it doesn't seem to matter unless it leaves you wondering which one is being referred to..
You will not however, see a steinkern referred to as an internal cast in a traditional peer review publication. Usually the discussion in a peer reviewed journal about a fossil is separated from the illustrations and the reader needs to know what the fossil looks like when reading the text. Paleontologists always refer to a mold as the thing capable of reproducing a copy of the original. 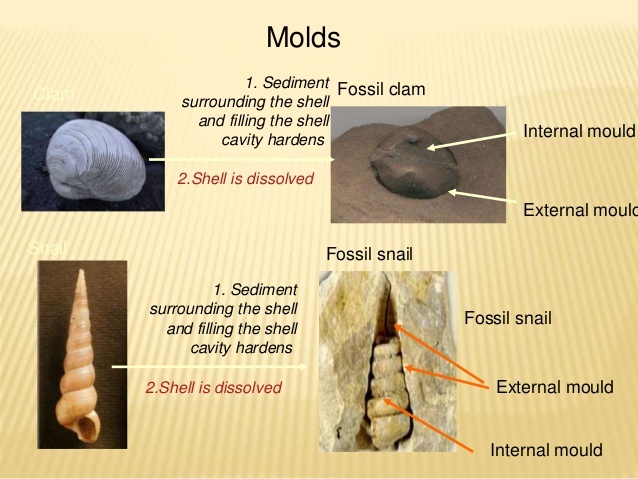 In the case of the internal surface of a gastropod, for example only an internal mold could be used to reproduce a copy of the original internal surface. Making that kind of copy is not something that is paleontologists usually do but it reflects the use of the words mold and cast the same way they are used by sculptors. In art you don't start with a mold, you start with an original. From that you make a "mold" and from that you make a "cast", a copy of the original. In the case of a fossil mold or cast the original is the shell that dissolves away as you said. A sculptor never makes a cast of the inside of anything and this is probably why there is so much confusion. If they did they would use an internal mold because it is always a mold that makes a cast of the original, whichever surface you are copying. A concave fossil showing growth lines is an external mold. A convex fossil showing the growth lines in an external cast (copy of the original outer surface). 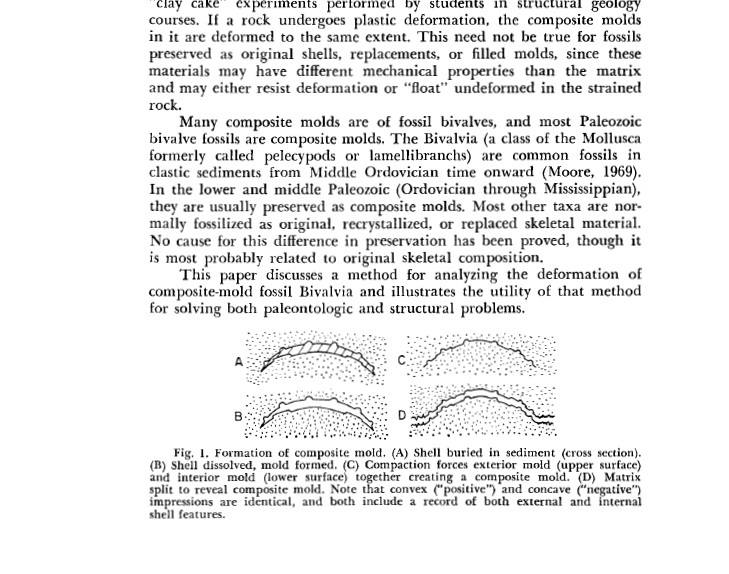 A convex fossil without growth lines (steinkern) is an internal mold ( could make a copy of the original internal surface). A concave fossil without growth lines is an internal cast (a copy of the original internal surface which is itself concave). In short, if it looks like either original surface it's a cast and if it could be used to reproduce either original surface it is always a mold just like the terms are used in sculpture. Anyone who disagrees should be able to show us an example of a steinkern being called an internal cast in a traditional peer reviewed journal and please this time not just a list of titles we may not have access to. 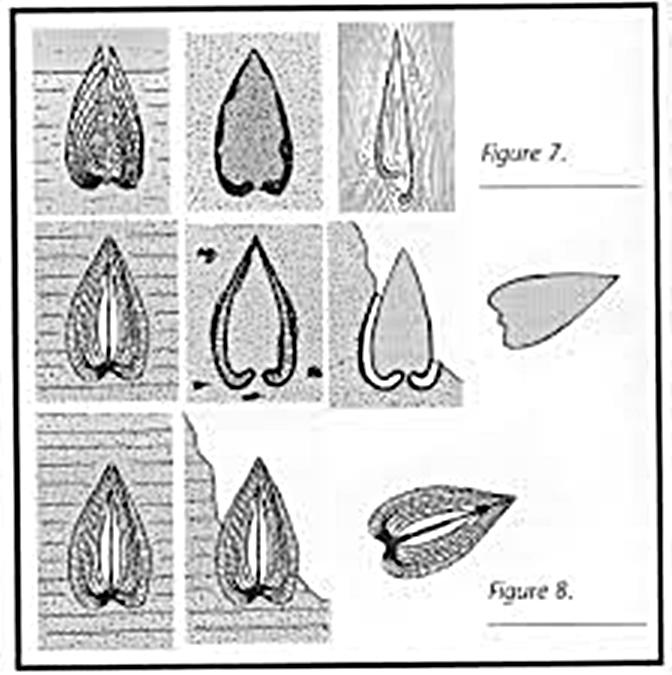 A concave fossil without growth lines is an internal cast (a copy of the original internal surface which is itself concave)." 1) At what point does the internal cast of material inside of the clam become an external mold as the clams shells are fossilized in increasingly open positions: 10 degrees, 90 degrees or 180 degrees. All material deposited next to the shells should be called a mold regardless if the clam is completely closed or not. The shape of the intererior of the shell (concave, flat or convex) does not define whether or not a cast or mold can be produced. 2) An internal cast refers to another different type of fossil. In the case of a silicified clam, you are looking at an internal cast if you are looking at the inside of the shell, some of which contain muscle scars. 3) Just because the internal surfaces of shells of most clams are concave does not mean that all concave fossil surfaces can create casts similiar to casts of sculptures that are usual made with concave molds. Aha.. 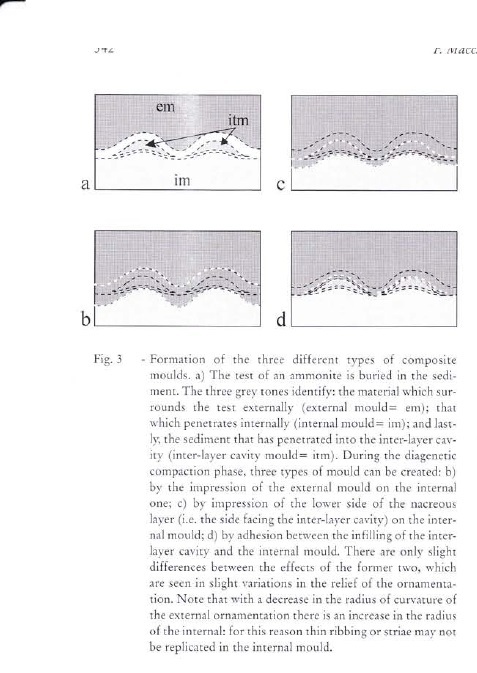 External mold, Internal mold, and Composite mold. I guess the internal mold of a closed bivalve could be considered a cast of the critter that lived inside the shell... sort of But I agree that it is the internal part of the mold required to make a cast of the (hollow) shell. To mix things up a bit more, here is Merriam-Webster's definition. Even paleontologists can use "cast" that way but if they include the word "internal", which that definition doesn't, then they don't mean steinkern unless someone can show me an example where one has. If you really want to mix things up there's always "endocast". Of course here the idea is to make a copy of what the brain looked like so it's still a copy of the original, therefore cast is correct, even though it's (mostly) convex and it's made against an internal surface but they still don't call it an internal cast. An endocast is an unfortunate and confusing term of art. An endocast is an internal mold of the braincase and not a cast of a brain. An endocast does not show many details of what the brain looked like. An endocast of a human skull will not show all the folds and crenulations of our brains. an "endocast" is useful in paleoneurology. Your post COULD/might be misinterpreted as stating that important morphological details are missing from an "endocranial cast". "What are molds and casts?  A mold formed when the original fossil dissolved. This left a cavity within the surrounding rock. This negative impression preserves the external details of the original specimen. One rare form of mold can form when lava flows around a living tree. Tree molds are found at Craters of the Moon, El Malpais, and Lava Beds National Monuments.  A cast is formed if this negative impression later filled with sediment. The cast may preserve all of the external morphological details of the original specimen but lacks any microscopic details.  A steinkern is another type of mold. Steinkerns can result when a shell (such as a snail or clam) filled with sediment and then dissolved. The hardened sediment preserves a reverse image of the formerly hollow inside of the shell." 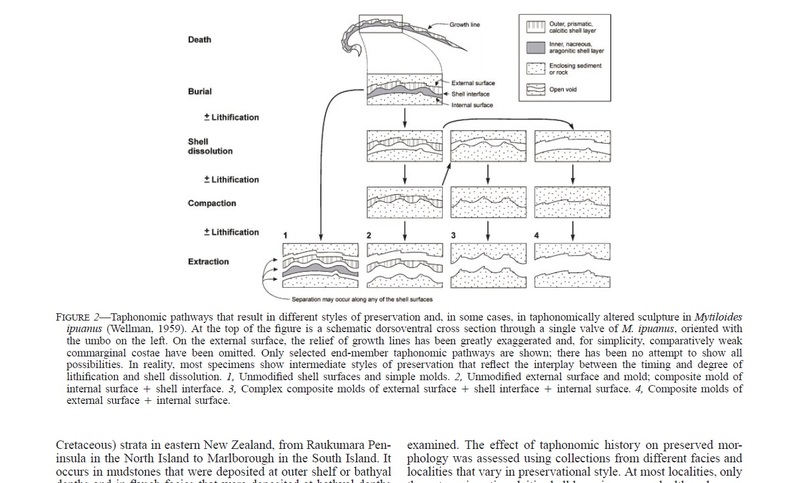 "Note on terminology A note on the use of the words positive, negative, steinkern, mould and cast in the context of fossil preservation is necessary. The skeleton of the coral is regarded as the original positive. The structure may or may not be diagenetically altered during life or before it is deposited in the sediment. When it is deposited in the sediment, most cavities of the skeleton can be filled with mud. The mud consolidated and the original skeleton is dissolved leaving a mould or negative. The fillings of the skeleton cavities are called steinkerns or internal moulds, being thus a special part of the mould. 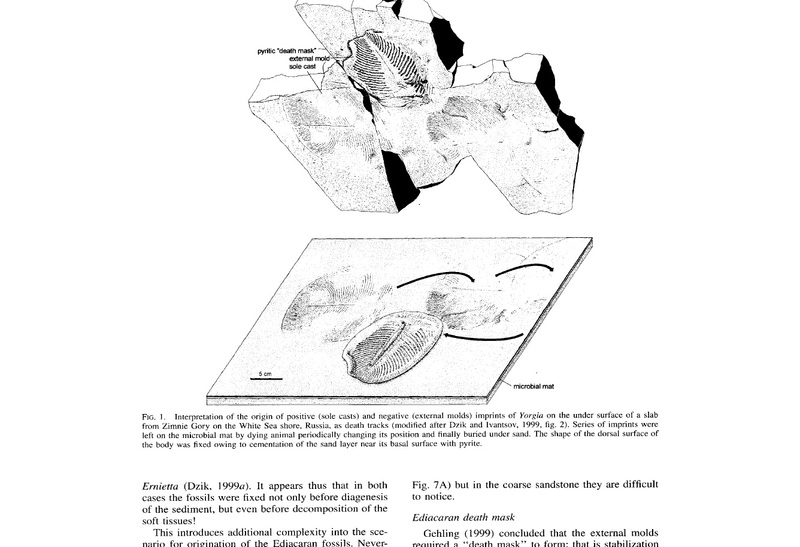 A cast would be the secondary filling of the mould by, for instance, calcite crystallization or new filling of mud and could be regarded as a secondary positive."